Take the block of dark turquoise clay and soften it in your hands until warm and malleable. Roll out into a sausage (about 1cm wide) on a flat surface. Take the block of white clay and soften it in your hands until warm and malleable. Roll it out flat, so it's about 3mm thick. Don't worry if it has messy edges or is slightly misshapen. Wrap the flat piece of white clay around the turquoise sausage. 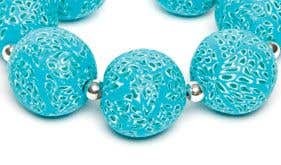 Make sure as much of the length of turquoise is covered and that the white piece wraps around it completely, overlapping slightly at the join. Cut the ends with a knife so you've got a smooth, flat finish at both ends. Roll out the sausage on a flat surface, making it longer and thinner and smoothing out the joins where the white piece overlapped. Cut the sausage into four equal-sized pieces. Place the four matching sausages together - place two on a flat surface, pressing them together so they adhere. Then place the remaining two top of this, pressing down slightly so they adhere to the bottom two. Roll this out on a flat surface until it's smooth and cylindrical, and longer and thinner. This may take a little while and it may distort the four pieces you placed together, merging them into one another but this is fine. Now take a block of light turquoise, soften with your hands and roll out on a flat surface until it's 3mm thick. Wrap it around your dark turquoise and white sausage, overlapping where the two ends meet to ensure it's completely covered. Use a knife to slice away the messy pieces at each end of the sausage, then roll against the surface to smooth out any joins. Keep rolling so it gets longer and thinner. Then cut it into four equal-sized pieces and place them together, as before. Once they are assembled, roll it out against a flat surface until it's smooth and cylindrical. Put to one side. Make seven equal-sized balls of clay using any colour from the pack. Then, take you knife and cut a thin slice from the front of your cylindrical piece so you get a thin, patterned section and place it onto the surface of the bead, flattening it out with gentle taps of your fingers. Repeat, using as many slices as needed until the bead is completely covered - Don't worry if the patterned pieces overlap. Repeat for the remaining beads. Once all beads are covered, give them all a quick roll between your hands to smooth out any joins where the patterned slices meet. Then put all the beads in a plastic container and put them in the fridge for an hour. Take a plastic needle and pierce each bead through the centre, wiggling it about a bit to widen the hole enough so that you can thread ribbon through. Bake according to the manufacturer's instructions. Cut a length of narrow blue ribbon to fit your wrist. Once your beads are baked and chilled, thread them onto the ribbon, alternating with silver spacer beads, as shown. Tie the ribbon in a bow to finish. Instead of ribbon, you could use elastic and tie it in a double knot with a dab of PVA glue on top for extra security.